A gift subscription can be given to a current subscriber or a new one. We'll send you a link that, when visited, allows the recipient to fill in their information and create a subscriber account. Or, if they already are a subscriber, the gift subscription can be redeemed as a renewal of their subscription. 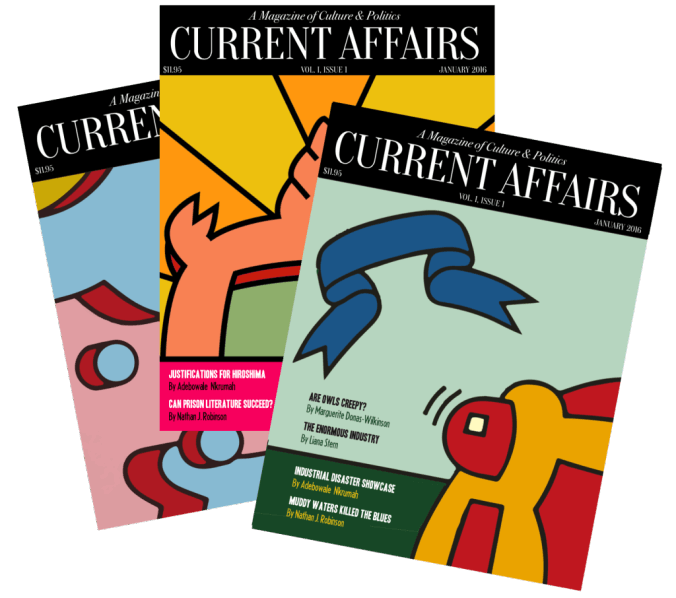 A Current Affairs subscription is one of the best known ways to improve your life in a hurry. Our print magazine is released six times a year, in a beautiful full-color edition full of elegant design, sophisticated prose, and satirical advertisements. Experience our dazzling illustrations and amass our collectible covers. Much of our content is exclusive to the magazine, so subscribing is the only way to truly experience Current Affairs in all its brilliant vibrance. Each issue has puzzles, cut-outs, quizzes, and other endless surprises that will keep you reading it for weeks and weeks. For $60, you can guarantee yourself a years'-worth of Current Affairs, delivered to your doorstep and ready for your coffee table. Subscribe to the magazine that will change the way your friends think of you!